Our Partners have invested in the latest CNC machinery to be able to offer cost effective manufacture of Acoustic enclosures for industry. CAD drawings are produced and fed to the machines that produce the sheet steel folded panels. A range of panel thickness is produced using Rockwool and Acoustic mesh to achieve the required decibel reduction. In some cases alternative foam based acoustic material is used. 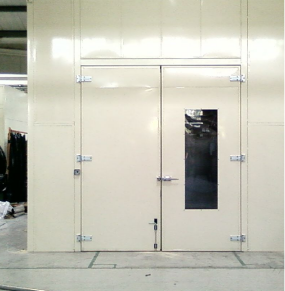 Attenuated air intakes, powered doors, hinged and sliding doors can all be built. Electric lights, fans are all available. Contact Solon Systems at sales@solonsystems.co.uk and our specialist team will be in touch with you directly. Why Solon Systems for Acoustic Enclosures For Industrial Machinery?